Almost everyone who loves ethnic food is sure to have heard, seen or eaten the items that originated in Tamilnadu, Dosai (with Sambar or Chutney), Idli, Vadai (or Vada) etc. 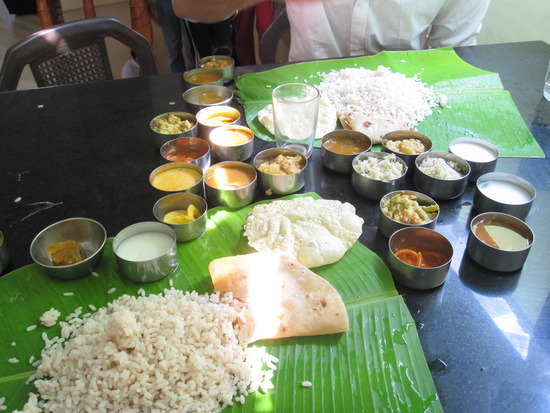 Most of the Tamilian cuisine is inherently lacto-vegetarian due to the fact that most of the population is hindu and religious and consider animals like the cows as holy. Traditional Tamil meals offer sambhar (made with different vegetables or even preparations) or Vatral Kozhambu, different types of rasam and buttermilk/curd to be mixed with rice and eaten along with the curries and other food preparations to go along with the rice. There are also variants of rice preparations like Coconut and Lime rice, Tomato rice, Puliyodarai (Tamarind Rice), Biriyani which go well with Aviyal/ curries/chips. Yogurt rice known as Dadhyonam among the Iyengar folks is an easy preparation. I like it best with a tomato or mango pickle. There are also thogayals like the Thengai (Coconut) Thogayal which can be mixed with rice and also Usilis like Paruppu Usili . They abound in Tamilian cuisine. But if you are a fatfree-er, you should be careful about some of those oily stuff. :) There are 2 versions of Vadai, the one made with urad dhal called the Ulundhu Vadai and the one made with yellow split peas called Masal Vadai. These go well with a couple of Idlis or Venn Pongal (the non-sweet version of Pongal) for breakfast. Upma or Uppuma is also ideal for breakfast or an evening snack. Molagapodi is a popular side dish that goes along with Dosa, Vada or Uppuma. The special tiffin items that have made Tamilian cuisine popular are Dosai (with Sambar or Chutney), Idli, Vadai (or Vada) etc. Masala Dosa is also very popular item. There is also a rava dosai made using cream of wheat or the adai made of urad and channa dhal. One may also have Vegetable Pakodas made of besan and different vegetables including onions,potatoes,Green Pepper,Brinjal etc. This cuisine also ties up with festivals local to Tamilnadu or India. To celebrate the rice harvest, Tamilians celebrate Pongal every year on January 14th and to commemorate the occasion, a sweet version of Pongal is made.. Festivals like Diwali feature sweets like Theratippal (made from milk), Mysore Paku etc.